At Daimar Stables, your horse's mental and physical state is of primary importance to us. 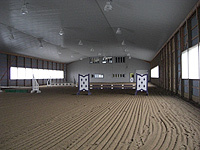 There is an indoor riding area 210 x 80 with mercury lighting, this includes a cozy viewing room of the entire arena. Stalls are cleaned everyday and bedded down with Pine or soft wood shavings. All stalls are 12x12 or larger, they have rubber mats and are constructed of white oak, steel and composite walls for optimum safety of your horse. 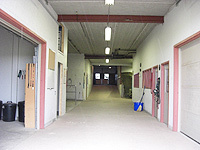 Alleyways are paved for maximum grip with in floor heating and wide aisles. 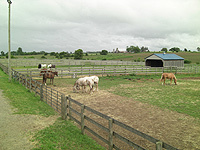 Enjoy our spacious paddocks for grazing and riding, future plans are to include a round pen and sand ring. In a 24 hour period horses will be turned out for as much time as possible, keeping horses as close to their natural state is most beneficial for their mental and physical health, by having the horses outdoors there is less chance of stall vices, and less of a chance for joint and lung problems. There is no individual turnout year round, unless your horse has an injury or special needs. There are 10 paddocks (8 are 1+ acres) and (2 are 3+ acres). Your horse will need to be assimilated into one of them. The horses have access to fresh water and salt during their turnout, water is changed twice daily. The horses either have access to hay at all times, (big round or square bales) or they will be fed 3 times a day, with small square bales of fresh hay, this is the normal feeding schedule. In the summer your horse will be turned out early morning, and come in early evening between 7:00 and 8:00 pm, to be grained and stay in for the evening, or if you prefer turned back out until 9:00 to 10:00 pm and then brought in for the evening. If UV rays are very bad, your horse may be brought in for a few hours in the afternoon. This schedule insures the horses are out of the most harmful of the suns UV rays and cuts down on the chance of sunburn for horses that are prone to this. This schedule may vary depending on extreme heat or nice breezy days. Turn out time in the winter, your horse goes out in the morning between 7:00 am and 9:00 am and comes in late in the evening usually between 6:00 and 7:00 pm, sometimes later depending on the weather. When it is extremely cold, windy, wet or icy, the horses are in their stalls. Turnout time is dependant on weather conditions. Included with stall board your horse will be fed a maintenance pellet with protein and vitamins twice a day, with bran, crushed flaxseed and trace mineral salt added to the feed, or a 3 quart scoop of hi-fat, hi-fibre once a day or divided into a feeding twice a day. Other feed will be available, such as Hi-Fat, Hi-Fibre, Patriot Surmount, Finishing Touch, etc. We offer a variety of feeding schedules please phone for more details. You are welcome to supply your own feed and additional supplements your horse requires and we will feed them to your horse. Custom Feeding Schedules Available, please phone Sherry for details. Board is due on the first of every month, if you are late paying your board, a five dollar charge will have to be paid every day unless specific arrangements are made between you and Daimar Stables. Smoking permitted in designated areas. You will ride your horse in a safe manner at all times and for insurance purposes we encourage you to wear a helmet. 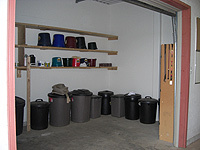 We expect that you clean up after yourself and your horse in all common areas such as the arena, aisles and wash bays. Turn off lights in the arena when you are finished and if you are the only or last person in the barn you will turn off the lights as you are leaving. Any door or gate you open please close when you are finished. If you would like your horse blanketed you must provide the blankets. If you have any concerns that you bring them to us immediately, we are here for you to talk to, if you have an issue lets get it resolved before it escalates. Proof of liability insurance for you and your horse, example OEF insurance. 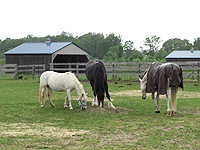 Proof of vaccinations and worming of your horse must be provided. Our bulletin board will contain a list of veterinarians used at the facility, it will also contain our schedule for vaccinations and worming. Please feel free to use your own veterinarian or make arrangements with Sherry to use one of our vets. You may bring in a coach for your horse but he must provide a copy of insurance to coach on the premises. Our bulletin board will have a list of coaches for different disciplines posted on it. You may use the farrier of your choice or use the farrier that we work with to shoe or work on your horse, we have access to one of the best in the area Larry Lesperance. If and when you decide our facility no longer meets your needs, we expect you will give 30 days notice or pay one month's board in lieu of notice. There will be no trailer on premises to transport your horse, so if you need a trailer you must provide your own trailer for transport, or talk to us to arrange a trailer.